This Fall marks the 10th anniversary since the release of Lauren Child’s book, I Will Not Ever Never Eat a Tomato. The book is just one in the best-selling series of Charlie and Lola books, chronicling the daily discoveries of two British children, 7 year old Charlie and his little sister, Lola, who is 4, going on 5. Each day, Charlie and Lola engage in imaginary play in order to explain a variety of experiences, including losing a tooth, being sick, and being a picky eater, and all with charming British accents. Charlie, who is the practical, patient, and knowledgable older brother, often looks after his precocious, ever-inquisitive, imaginitive, and very active sister. “Sometimes I have to keep an eye on her. This can be a hard job because Lola is busy doing lots of things all at once,” says Charlie. Through Charlie’s guidance and creativity, Lola is able to see the world in a completely different and delightful way, learning little life lessons and changing her mind about the most basic presumptions, such as all spiders are bad, peas are terrible, and bedtime is boring. Instead, spiders become extremely interesting, peas become green drops from Greenland, and bedtime becomes more exciting when you get invited to an animal pajama party. The books and television shows also introduce us to Charlie and Lola’s best friends, Marv and Lotta, as well as Lola’s imaginary friend, Soren Lorenson. The friends play the expected supportive character roles, but also give us a look at how the brother and sister interact outside of their own family. 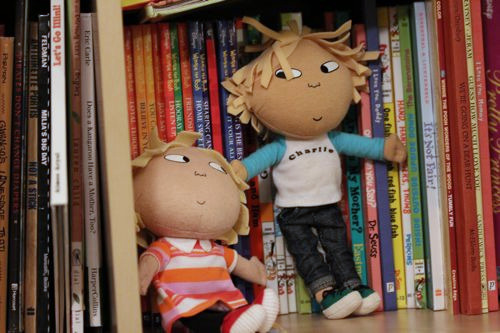 Although I was well out of my childhood when Charlie and Lola first appeared in books, then later on television via the BBC, I became enamored with the duo after my children were born. I love how caring Charlie is toward Lola and how he is quick to lend a hand when she is in need of help. Likewise, I love Lola’s consistently cheerful attitude about life, interspersed with hysterical 4-year old drama – “I am really ever not so well,” says Lola when she has a cold and “I’m far too extremely busy”, she exclaims when she is playing. After a few years of reading and watching Charlie and Lola, I find myself explaining things in Charlie and Lola terms, mashed potatoes or dumplings are now “clouds”, fancy dress shoes are a must, and pink milk is my favorite and my best. Reading their books makes me wish I was a kid again, discovering all of those little things about the world that, as an adult, I surely take for granted. I know that I can’t turn back time, so instead, I will continue to see a bit of the innocence and spontaneity of Charlie and Lola in my own children. So, for all of the Charlie and Lola fans out there, let’s raise a glass of pink milk to Lauren Child – Thank you for bringing us two very special storybook characters and may you have an extremely lovely Happy Anniversary!